It’s just like in the movies. Create your own time lapse video by setting your phone on Hyperlapse. The camera alternates the number of shots per second by slowing down then speeding up again—also known as the frame rate. It does all the work for you! The frame rate is automatically adjusted depending on the scene being recorded and the phone’s movement. 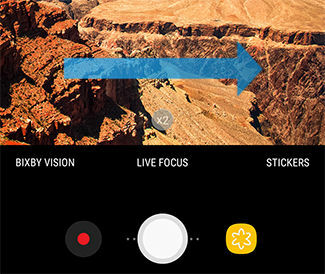 3 To access Camera modes, swipe to the right. Note: Hyperlapse mode is only available for the Rear camera. 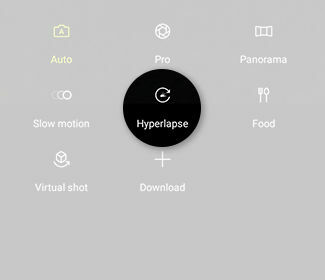 5 To start recording a hyperlapse video, touch the Record icon. 6 To stop recording, touch the Stop icon.